Our Clinic excels in the prescription and provision of custom knee braces to aid you in returning to the activities you are most passionate about, whatever they may be. Custom fit down to the millimeter, our braces are typically 100% covered by your private insurance. We support the use of image-guided techniques using computerised images to obtain greater accuracy in assessing and treating injuries. The Knee Clinic is Alberta’s only private knee clinic, created to alleviate long wait times for patients. We provide qualified knee expertise and make specialized care available to you within days. Here from out of town, and need an appointment? No problem! We offer non-residents a full range of services and can bill to a wide variety of out-of-country medical plans. In Alberta, up to 100,000 people injure their knees each year. For many, this experience is painful and debilitating. An injured knee should have professional care, ideally within 72 hours, but getting this care can be challenging. Public forms of knee care may take months to access. Moreover, despite the common nature of knee injury, family doctors receive relatively little training on the musculo-skeletal system. The Knee Clinic, Alberta’s only private knee clinic, was created to address this gap in knee expertise and make qualified, specialized care available within days. Thank you Dr. Dale. I avoided knee surgery with your help, the knee brace, PRP injections and the help of your physiotherapist. I had a shredded meniscus and had to learn to walk again after poor advise from other professionals. I am fully recovered and able to engage in light impact workouts again! Fit, healthy and happy! I travel all the way from Northern Manitoba to receive treatment here. I like coming to Dr. Macdonald’s for appointments very much. While he is working on you he teaches you what bone he is working on and what is wrong with it. Dale has saved my life on more than one occasion and I am really grateful. Having been involved in competitive sports for 15 years and having been under the care of very highly regarded practitioners I can say that Dr. Dale Macdonald is the finest chiropractor or physiotherapist I have ever been treated by. Having solved a chronic neck problem overlooked by many chiropractors, I can say that Dr. Dale is nothing short of brilliant. I have to say Dr. Dale is brilliant after months of radiating shoulder/arm pain, Dr. Dale has solved my agony which other chiropractors couldn’t. Absolutely talented. Recommended highly. I have been seeing Dr. Dale for the past year, to treat my persistent back issues (from my desk job). His treatments have relieved my issues and allowed me to perform and focus at my job. They are extremely Knowledgeable and professional. I gladly recommend them to my friends and peers. After years of pain and physio I finally found Dr. Dale. Almost one year to the day from my first visit I feel wonderful. Have been able to enjoy living again; walking, golfing, cycling. Living with chronic back pain has not been fun, however to attain the mobility back has been my lifeline. I will refer anyone who need Dr. Dale to relieve pain. THANK YOU so much for helping me get across the finish line, finished in 2:01 – WITH NO PAIN… not bad considering I had a very long taper due to my calves and I didn’t even take any Advil or nothing before/during/after the race- and I am walking good today!! Congratulations on your 10th year anniversary! Where did the time go? I’m not certain how long I’ve been your patient, but want you to know how grateful I am. I had been in a car accident that left me with mobility issues and pain in my neck (no I didn’t say I was a pain in the neck!). I had always had reservations about chiropractors and therefore tried every other type of treatment under the sun before Dave referred me to you (THANKS Dave!). You took the time to talk to me about your profession and what I could expect in terms of treatment. You answered all my silly questions in a professional manner and set my mind at ease. From the time I started receiving treatment, I can honestly say I feel so much better and want you to know how thankful I am. Congratulations to you and your team and I wish you continued success in helping others! I would like to acknowledge Dr. Dale Macdonald for his excellent chiropractic care and treatments. A car accident had caused some injury to my back and neck and after only a few months of treatments by Dr. Dale, I was completely recovered. His knowledge of the body structures and his expertise and comprehensive training and skills allow him to quickly asses the problem and treat it directly with the right adjustments to bring maximum impact and benefits. It is a pleasure and inspiration to be treated by a Dr. in the health profession who has so much caring, concern and skill in the art of healing. I am extremely happy that I and my husband have had the good fortune of being patients of Dr. Dale. I can’t say enough about this office! Oh my God, a life saver really. I am running again. YAY! Took a while to get myself to come here. I will run the Police Half Marathon for the first time. Been wanting to run this half since last year but couldn’t due to knee pain. Have been to 2 other chiro places and been told many things like stop running. Oh I have my passion now. I will continue to write again after my race. Dr. Dale is a critical partner in my health care team. His expertise is invaluable and respected. Patient education is an integral part of his service and something I value the most. I came into this process in severe pain in my lower back, knee and leg. Having tried alternatives Dr. Macdonald and his physio department had me pain free and returning my life to normal in a few short weeks. Where other treatment failed Dr. Dale and his team made a world of difference. Dale, you have made a big difference with my knee injury. You explain things well and are very patient with questions. I also very much appreciate how positive you are. If it hadn’t been for you I would have despaired endlessly about this injury. Thanks for your wonderful care and for helping me build a healthy perspective. I avoided knee surgery with your help, the PRP injections and your physiotherapist. I had a shredded meniscus and had to learn to walk again after poor advice from other professionals. I am fully recovered and able to engage in light impact workouts again! Fit, healthy and happy. Thank you!! 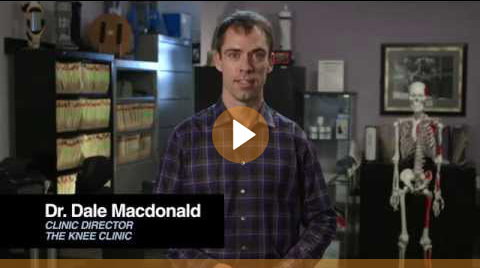 The care provided by Dr. Macdonald is simply outstanding. Thank you very much. Worth the drive from the NW to see the talented Dr. Macdonald. He has made life better. Rebecca is an AMAZING massage therapist! She is by FAR the best massage therapist I have ever had! I appreciate the deep pressure she gives throughout the massage. She definitely knows what she is doing and I will for sure be seeing her as long as she is around. Thanks for the support and TLC during my stress fracture. I will do you guys proud in Philly this fall. I promise sub 3 or bust! I have been to many different clinics and a highly competitive athlete and elite sports has diagnosed and treated me greater than any I had been to before. Thanks to your diagnosis and treatment I was able to complete 3 weeks of rigorous field work in BC. 23 days of freeze dried meals, rain/snow/sleet/hail, glaciers and a whole bunch of geology- but no knee issues! I have been coming in for just over 5 weeks. Barely walking to now being pain free and enjoying life again. Thanks to Dr. Dale and Staff! Thanks Dr. Dale for your help with my knee and giving a good assessment and saying no knee replacement. You explained a lot more than AHC Dr’s did. Am so grateful for that and doing PRP injections and brace-helping me so much and getting my vitamins too. Staff are helpful too. Thanks again. I have been coming to this clinic now for almost a year and I can say that I am 90% better with my knee pain! I thanks God that I found you! Thank you Dr. Schimke and Dr, Macdonald for the professional help and advice you have given me throughout the year. If it wasn’t for you I would have already had surgery on my knees! The shots in my knees have allowed me to keep working and they are the most significant measure in my pain therapy. I feel so much better because my job is very stressful when I have pain. This is a lifeline to a healthier happier life! Thank you! We’re Alberta’s only private knee clinic, providing knee expertise and qualified care within days. As a fellow of the Royal College of Chiropractic Sport Sciences, Dr. Dale Macdonald is one of only four manual sport specialists in Alberta. Our private, fee-for-service facility reaches the 48—72-hour standard of care for initial assessment of your knee injury over 95% of the time, and our wait times are never over 2 weeks. In collaboration with our highly trained staff, we offer a full spectrum of services including knee pain treatment for patients with an injured knee.